9.30 am to 6 pm (Tuesday to Sunday). 9.30 am to 9.45 pm (Thursdays). Closed on Mondays, 25 December and 1 May. The Museum will start to close at 5.15 pm (9.15 pm on Thursdays). Latest entrance is 4 pm (8 pm on Thursdays). Early morning (before 11 am) or late afternoon (after 3 pm). We are comparing Musee d'Orsay Skip the Line Tickets Prices from leading ticket suppliers and Try to find you Cheap tickets prices on the market. The Orsay Museum is recognised for hosting one of the worlds greatest collections of Impressionist art. Built inside the former Gare d’Orsay railway station, the very same station that hosted the Universal Exposition fair in 1900, the Orsay Museum is a fantastic example of the Beaux-Art style. Inside you can also find exhibitions of Post-Impressionist and Art Nouveau styles and the works of French Artist dating between 1848 and 1914. The museum regularly hosts temporary exhibitions which include American Abstract Art, Symbolism of the Baltic States, and international photography exhibitions. This is ideal for anyone who wants to learn more about the impact of art and the art movement in France and the Parisian culture. For visitors on city breaks skip the line entry will be essential, it will save you a lot of waiting time. Suitable for adults or children, individuals or small groups. Your Experience With Musee d'Orsay Skip the Line Tickets? Get super fast-track entrance to one of Paris’ most popular attractions, the Orsay Museum. Admire the astounding artworks of the great Van Gogh, Garnier, Nadar, Manet, Degas, Courbet, and more. See the ‘Bal du Moulin de la Galette’ and ‘Le Dejeuner Sur l’herbe’ with your own eyes. Take your time to explore the permanent and temporary galleries on a self-guided visit to the museum. Enjoy the freedom to enter the museum at your preferred time and browse the exhibitions at your own pace. What Musee d'Orsay Skip the Line Tickets Includes? Admission ticket to the Orsay Museum. Priority skip the line entrance. Access to all permanent and temporary exhibitions. Unlimited time inside the museum. Once inside the museum you have until closing time to explore so we recommend arriving early available so that you have plenty of time. 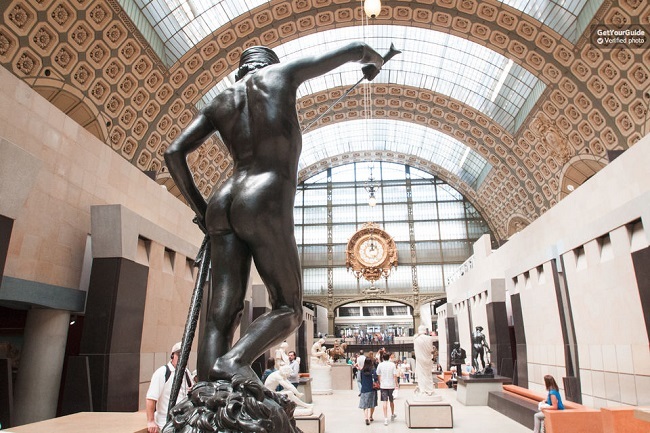 Travelers Reviews about Musee d'Orsay Skip the Line Tickets? Travellers have given the Orsay Museum a 4.5 out of 5-star rating on TripAdvisor. The skip the line tickets also have consistently good reviews with a 4.7-star rating from Get Your Guide users and a 5 out of 5-star rating from Tiqets users. Travellers have described the museum as ‘amazing’, ‘extrodinary’, and a ‘fantastic experience’. Comments generally agree that skip the line tickets are worth purchasing unless visiting on the first Sunday of the month. The Orsay Museum is partially wheelchair accessible. Tickets will be delivered to the email address provided. Either electronic tickets or printed tickets will be accepted at the entrance. Tickets for some tour providers are not refundable so please check the cancelation policy in advance. Usually ticket from Get Your Guide and Viator are fully refundable up to a specified number of days in advance. Visitors under the age of 18 and EU members under the age of 26 can enter the Orsay Museum free of charge. The museum is free of charge for everyone on the first Sunday of every month. There may be a short queue at the fast-track entrance due to security checks. Your ticket is valid only of the date specified in your reservation. There are airport style security checks at the entrance; do not bring any sharp objects or liquids. Meeting Point: Go directly to the Orsay Museum fast-track entrance (Entrance C). Address: 1 Rue de la Légion d'Honneur (Quai Anatole France), Paris. Duration: The duration of the guided tour is around 2 hours.